Collective recognition is more important than the raising up of icons: there is no mastermind in the transformation of society. Sister Megan Rice, Michael Walli and Greg Boertje-Obed. Credit: www.americanfreepress.net. Some rights reserved. Megan Rice is a member of a Catholic religious order called the Society of the Holy Child Jesus that was founded in 1846. She’s also serving a three-year prison term in Brooklyn, New York, for “sabotage of the national defense”—a judgment handed down by Judge Amul Thapar for entering the Y-12 nuclear weapons facility in Oakridge, Tennessee in July of 2012 without permission. 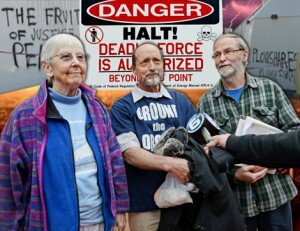 Greg Boertje-Obed and Michael Walli, two more experienced Plowshares activists, accompanied Rice in this action and were given longer sentences. What follows are Sister Rice’s observations and corrections, along with some additional material that I think is relevant to the points she makes, collected by me from the other articles to which she refers. This new piece was approved by her prior to publication. “While safety concerns were the primary focus of most media coverage (to the point that the critique of nuclear weapons was lost in the hysteria over a spectacular trespass), the point the three protestors would make instead is that we are less secure simply because these weapons exist as moral and legal abominations, regardless of the efficacy of the walls and fences alleged to protect them.” Rice, Boertje-Obed and Walli believe that it’s impossible to ‘secure’ nuclear weapons without eliminating them. A common theme in Rice’s reactions and the commentary surrounding the Y-12 judgment is that collective struggle and recognition is more important than the raising up of three individual heroes, or indeed a focus on Rice herself in contrast to Boertje-Obed and Walli. “To listen to many outlets you would almost think Sister Megan acted alone” as Barfield puts it. The article she’s referring to was published by journalist Nicholas Kristof on August 16th 2014. It’s a review of Jo Piazza’s forthcoming book entitled “If Nuns Ruled the World.” Kristof opens the piece with a call for more “superheroes in an age of villainy”, before citing nuns as possibly “the best superheroes yet.” The celebration of individual heroism over collective action is a long-running theme in Kristof’s writings. It’s a powerful statement that summarizes what for me is the key to Rice’s story: the constant practice of openness, sharing and solidarity to set alongside the theory. There is no inconsistency here, and that makes her example, and that of her two colleagues, all the more compelling. The rest, I think she’s saying, is up to us.